In a tray place the coconuts in the preheated oven for 25min. Place a stock pot on the stove top, add the Mineral water and turn heat to high. Add Fish bones, Sweet potato, Onions, Carrots, Carrots, Galangal, Lemongrass, Lime leaves, Garlic, 20g basil, 20g mint, 15g coriander stems, cinnamon sticks to the stock pot and bring to a medium boil. In 3 cups of water add the vermicelli noodles and bring to the simmer on a low heat. Once the stock is lightly boiling, poach the fish fillets on the top until cooked. Place macadamia nuts on an oven tray and roast until lightly toasted. Remove macadamia nuts and crush unevenly. Remove fragrant fish stock and strain, keeping aside the sweet potato and cooked fish fillets. Rough chop coconut flesh to just bigger than bite size pieces and add half to a high-speed blender. Remove vermicelli noodles from the hot water and rinse with cold water set aside. 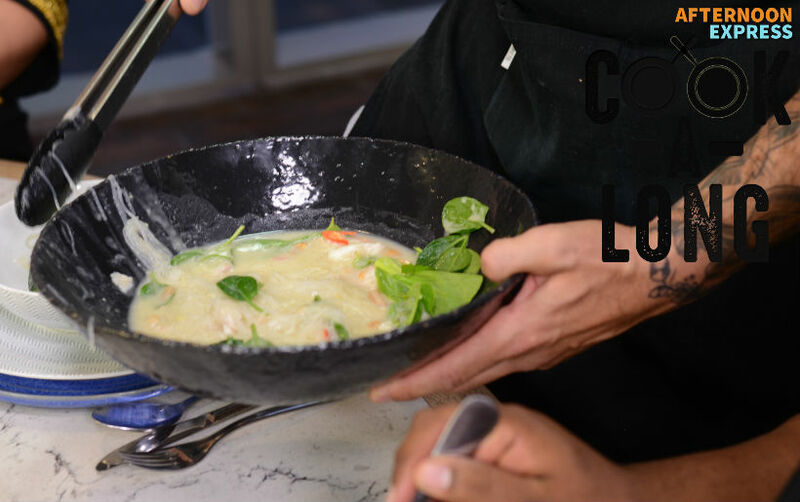 On a medium speed, blend the coconut pieces with the fish stock in two batches. Strain over a clean pot and place back on the stove. Add sweet potato and using a stick blender, blend in the sweet potato flesh until creamy. Add the, lime juice, washed spinach, strained vermicelli and flaked fish. Plate in a deep bowl and sprinkle with the macadamia nuts, 10g mint, 10g basil leaves, 10g coriander and lime zest and chili.